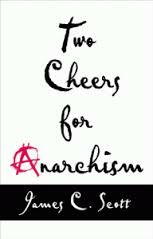 James C. Scott (2012) Two Cheers for Anarchism, Princeton, N.J.: Princeton University Press. In Two Cheers for Anarchism, James Scott puts on his anarchist glasses and looks at the modern world through an ‘anarchist squint’. Following the works of Pierre-Joseph Proudhon, who first used the term ‘anarchism’ as mutuality or cooperation without hierarchy or state rule (p. xii), Scott emphasises a ‘process-oriented’ anarchist view that involves a ‘defense of politics, conflict and debate’ and rejects the ‘utopian scientism’ – grounded on the principles of statistical reductionism of reality and depoliticised administration of things – that dominated much of anarchist thought in the twentieth century (p. xiii). The central question that drives Scott in this book is whether apparent visual disorder could be the key to a finely tuned working order. Addressing this, Scott builds his arguments on anarchism and order in modern society through a series of essay fragments bound together by distinct themes rather than a single linear thesis. The book is divided into six chapters. The first chapter looks at the issue of insubordination and discusses ‘the paradox of the contribution of law breaking and disruption to democratic political change’ (p. 17). For Scott, when individuals are denied the institutionalised means of public protest, they follow the non-institutionalised means which, although they create mass disruption and threaten public order, often act as a medium of reforming the system and bringing political change. In Chapter 2, Scott discusses how the modern nation state’s homogenising and hegemonising tendencies have resulted in the destruction of vernaculars. However, he believes that the modern state is not ‘everywhere and always the enemy of freedom’ (p. xiii). The importance of freedom, openness and creativity, expressed through the ‘adventure playground’, in the growth of human beings is discussed in Chapter 3. Chapter 4 examines the role of the petty bourgeois, who Scott believes represent a ‘zone of autonomy and freedom’. In Chapters 5 and 6, Scott provides a defence of politics and exposes the anti-politics machine at work in knowledge production. What is evident in all this is a sense of disenchantment. Scott seems worried about the decline of ‘anarchist sensibility’ – mutuality, creativity, cooperation and freedom – in post-modern societies. Although it may be alleged that Scott is a romantic, living in a pre-modern agrarian society, his book provides an excellent anarchist critique of the modern state and society. It is filled with numerous examples from around the world, which makes it an interesting read and recommended to students of sociology, political philosophy and comparative politics.